Toulouse has an important place in French rugby history. The location of the ever club game in 1968, it was also the home of Femina Sports which won nine out of the first 14 national titles. However, that run ended 1985, and by the summer of 2014, Fonsorbes - a small club in the suburbs of Toulouse – was the area’s biggest team. Although it held a spot in the Armelle Auclair (the second level of French rugby) it had never been in the running for a place in the Top 8. Then Stade Toulouse arrived, took a controlling interest in the club, and moved them the 20 or so kilometres to the centre of the city. The team remained amateur, but with access to the coaching and other resources available at the professional club. Success was immediate, with promotion won in its first year, and top four finishes ever since. This year, after at third place finish, they met Lille in their third attempt to win a semi-final, travelling north this weekend needing to reverse a narrow 3-6 defeat in the first leg. 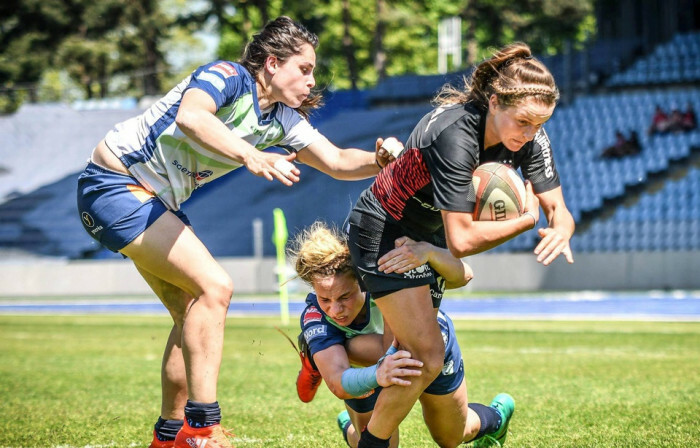 And led by French captain Gaëlle Hermet they won an exciting game, televised live, by 24-19, giving them a two-point win on aggregate, and a place in the national final for the first time. As a result, for the first time since 2014, this final will not be Lille v Montpellier. Lille had had the first scoring opportunity, but the penalty in the opening five minutes went wide, after which Toulouse grabbed the initiative with their powerful pack driving over after eight minutes, before Maïlys Traoré doubled the score on 22 minutes. Another Lille penalty attempt hit the post shortly afterwards, so the visitors lead 10-0 at halftime. Toulouse added a third try to lead 17-0 shortly after the restart but after 55 minutes Lille finally got onto the board with a converted try, and pulled the score back to 12-17 three minutes later. Entering the final 10 minutes, a Wendy Divoux try for Toulouse was concerted to extend the lead to 12 points. With two minutes left a third Lille try narrowed the overall Toulouse advantage to just two points, but that was to prove enough. In the final they will meet champions Montpellier, who also won by two points, beating Blagnac 21-19 after a 12-12 draw in the first leg. Their semi-final followed a similar pattern to the game in Lille, with Montpellier taking the early lead, but the Blagnac fighting back. Entering the final 5 minutes Montpellier lead by 21-14 before Audrey Forlani scored in the corner. The kick from the touchline was missed, and the champions held out for the final minutes to reach a seventh consecutive final, and 11th in 12 seasons.